April 7, 2010 – Hawker Beechcraft Corporation (HBC) and Pratt & Whitney Canada (P&WC) today announced the successful first flight of the second Beechcraft AT-6 production representative test vehicle (PRTV). The aircraft features a new P&WC PT6A-68D engine with 1600 shaft horsepower (shp) that greatly improves the overall performance of the AT-6 to. 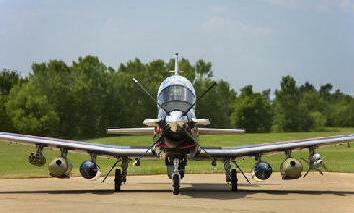 The AT-6 is a structurally strengthened derivative of the highly successful U.S. Air Force (USAF) and U.S. Navy (USN) T-6A/B trainer that will address the mission needs of the USAF for a Light Attack and Armed Reconnaissance (LAAR) aircraft. The USAF is expected to launch an acquisition program this year. The integration of the PT6A-68D engine, designed to improve aircraft performance over the first AT-6 PRTV, was accomplished by the HBC-P&WC team in only nine months and was executed concurrently with the first PRTV’s A-10-based mission avionics upgrade. The new T-6 derivative, while incorporating structural improvements and increased electrical power generation required for the LAAR mission, still retains approximately 95 percent overall commonality with the baseline T-6B. The AT-6 is designed to be able to quickly transition pilots between basic flight training missions and complex NetCentric LAAR missions. The AT-6 incorporates the very best of proven training and close air support capability to meet expected LAAR requirements. The aircraft covers a wide mission spectrum that includes training, manned Intelligence Surveillance and Reconnaissance and light precision attack, while also offering non-traditional capabilities for Homeland Defense, Homeland Security and Civil Support missions. HBC has been meeting the needs of U.S. and foreign military customers around the world with trainer, weaponized trainer and special mission aircraft, which are currently in service in more than 50 nations. Today, all USAF and USN student pilots train in a Hawker Beechcraft aircraft.